Disneynature is back with their annual foray into nature movies by taking a trip into China to focus on several animals while creating complete fictional stories about them. If you haven’t seen one of these Disneynature films before, what happens is that they send in cameramen to shoot different animals in their natural habitats, usually breathtaking habitats by the way, and then there is a narrator who gives these animals names and tells you the fictional story of these animals’ lives. This time, we had three main animals to focus on: A cuter-than-hell panda bear named Ya Ya whose the mother of the even cuter Mei Mei, a family of monkeys featuring the young male named Tao Tao and the snow leopard Dawa and her two cubs. There is absolutely no doubt that these three main animals are the stars of this movie. Ya Ya, Tao Tao and Dawa’s plights are followed, seeing how these animals and the animals around them survive over a year in the Chinese landscape. We see the perils of the seasons changing, including a dramatic snowy season, other predatory animals, and the struggle of these animals to find enough food or comfort to keep alive. These individuals running the camera get the most amazing shots of these characters where it seems as if you can tell what they are thinking. These animals’ expressions are more revealing, emotional and telling than most of the actors from Unforgettable. John Krasinski is our narrator for Born in China, and he does a fine job. He does not make himself the star while still delivering the lines provided for him with good humor and timing. Krasinski knows what is selling the tickets for this movie, and he does not step on the animals and their screen presence. Chuan Lu directed this movie, and he lives up to his billing as one of the top young Chinese directors. The shots are wonderful. As I said, you are certain that you know what every animal is thinking at all times. The land of China is stunning, with beautiful cinematography in every shot. I must say that there was one scene with Tao Tao, his baby sister and a hawk that stretched my quota of believability. I believe that the entire sequence was made up by piecing together a series of shots to tell the story. Maybe they did that for the entire movie, but that was the only moment that felt manipulated. I must say though, I was wondering why none of the camera crew wouldn’t slip poor Dawa a burger or something during the winter when she was having trouble finding food to feed her cubs. There is another time when I find it difficult to believe that the documentarians did not intervene on behalf of poor Dawa, (SPOILER), the most tragic of these animals. This movie was beautifully shot, had engaging animal characters that you felt for, and had enough humor to engage an audience. Some of the scenes felt orchestrated, but most of the film was realistic. Born in China dealt with some heavy issues of life and death and the circle of life and it did it by giving these animals human thoughts and characteristics. And damn if those animals’ faces did not tell the same story. 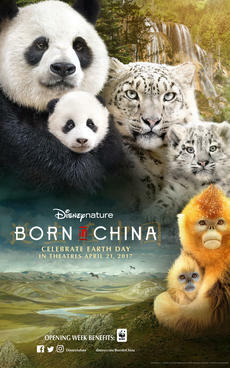 This was an entertaining film, and one of the better offering from the Disneynature series.